My Father Thomas William Boulton. 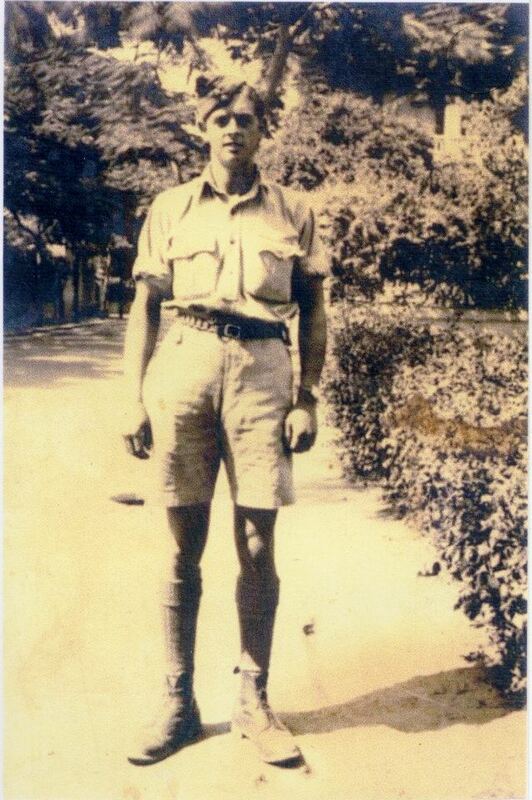 MY FATHER STATIONED IN MALAYSIA. WHAT I KNOW OF MY FATHER’S EARLIER LIFE. Thomas William Boulton was born on the 23rd August 1922. He was the only son of James and Harriet Boulton. My father had two sisters, Harriet and Doris, Harriet was 3 years older and was born in 1919 and Doris was 2 years younger and was born in 1924…..Ummm middle children! l wouldn’t say l was the ‘black sheep’ of the family, l’m more of a dark horse, but my father and even more so, his father before him definitely deserve that title. My grandfather James was a complete rogue by all accounts, l did know him and wasn’t too impressed, l thought he was a tramp. He used to pop out his glass eye, which used to make my flesh crawl. l thought maybe this was a war wound, so l never showed my disgust, but now l am thinking it was because he had syphilis! Apparently he was some kind of low life that brought syphilis back to the home and infected my grandmother with it and because she was so ashamed she never went to the doctors, it went to her brain and she died by the time she was forty in 1937. Apparently my grandfather fled with my father, (who was just fifteen) leaving his daughters (eighteen & thirteen) behind. This action had a knock on effect and negative impression on my father, l feel if my grandmother hadn’t died so young, things might have been different. Apparently my grandmother’s family, two brothers who were both pro boxers, were gunning for him, so my grandfather James fled with my father to Aldershot where my father enlisted in the army, he was stationed in Malaysia in World War Two, which l hear is one of the worst places to be posted. When the war was over he must have decided to stayed in the area where he met my mum. l don’t know where they met, possibly in the local pub, but it wasn’t by any ad. in the paper!!! My mother was only sixteen when the war ended, so l’m guessing it wasn’t this early. My father was twenty three at the end of the war , he was 7 years older than my mother. 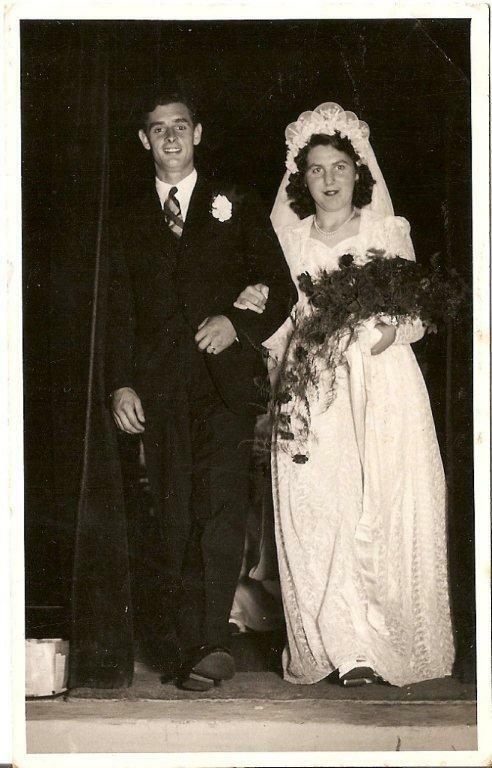 My mum and dad on their wedding day…….This was the happiest day of my dad’s life, he would never see a happier one, except my birth of course! Yesterday was my dad’s birthday (23rd August), sad really that l can’t ‘big’ him up – still feeling raw and confused by him and his choices in life – never has the precept ‘Your choices define you’ felt more apt and was indeed a life sentence for him. For those friends that know me well, know that l come straight out with stuff, well, when it came to my dad, l didn’t, l should have said “pick me!” l should have said we can get through this together, but l was struck dumb in his presence, unable to say what l wanted to say – why? For fear if l spoke up l would lose him too, which ironically l did anyway, so l kept quiet……A rare thing for me! The moral of this story is speak up, however hard it is – don’t miss the opportunity to make yourself heard, if no one listens never give up…..Don’t hand yourself over to fate without a fight !! After my mum’s death in 1954, l was three and a half, l remember going to work with my dad at the place he worked (Always Welding) he was a Press Brake Setter OP. This is in Ash, Surrey, but obviously this wasn’t for long, so l guess my Nan and Auntie Lil did most of the caring for me. l remember that my father did not like my Nan, and l believe she never thought much of him either. l have heard recently that there was quite a big bust up on the last day my cousin Tony saw my dad at Nan’s house……Apparently she was that mad at him that she picked up a carving knife and threatened him with it! This was not her usual behaviour, l’m guessing it had something to do with either him marrying the wicked stepmother or putting me in the home? We will never know? l found out a very interesting, might even say funny thing about how my dad met the ‘Wicked Stepmother’…….He advertised in the paper “Lonely Widower” and she answered the ad!!!! All l can do is shake my head in resigned incredulity…..!!!! l remember going to Durham (Up north) for maybe a year? l went to school there (l remember the lovely puddings at school dinners), obviously we went there for him to meet up with her, as that’s where the wicked stepmother came from, yes l remember her name, it was Audrey Rothery. When we came back to Surrey l got very sick with appendicitis, this was in December 1957, just before my seventh birthday, l was there for Christmas as well, but while l was safely out of the way they got married! l only went back home for a short while, because now this wicked woman had married my father she showed her true colours, she was unbelievably cruel both mentally and physically. ……her and her evil son had their foot in the door and she got rid of me as soon as possible. l call him ‘The Cookoo’. l’m not sure when l went to the convalescent home, ‘Little Pond House’ as it doesn’t stipulate in my records, but l went to Thornchace Hostel at the beginning of 1959 (l was eight) and by the end of ’59, just before my ninth birthday, l was in ‘Malmesbury House’ National Children’s Home in St Leonards, Hastings. 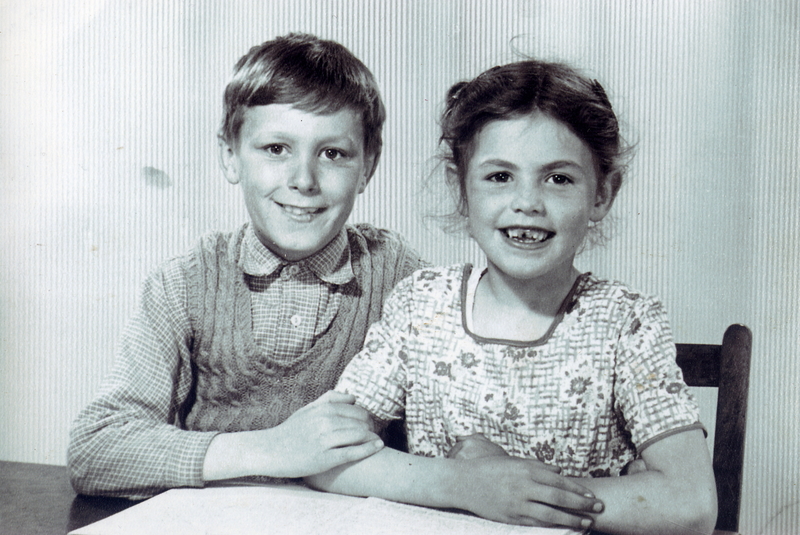 Last and only picture of me at my dad’s, l’m with my cousin Mick….Bless him! Mick is my mum’s nephew and like a brother to me. l can’t get my head around how anyone can sacrifice their whole family for a women, and a bad women at that! l really don’t think a good person could do this. How could he give me up for such a women? A women who answered an ad? !…..Because of this his family never spoke to him ever again. As for her, the wicked stepmother, l feel that justice was never done, she was the sort of person who does terrible things and thinks nothing of it, l haven’t come to any satisfactory explanation as to how karma works in her case? Maybe it’s that no one has anything good to say of her and l don’t think she ever achieved anything, least of all any happiness. Hers and my father’s legacy is one of bitter disappointment and l will write her part in it all……And it won’t be PRETTY….!!! For me, with all my disadvantaged childhood, l was and still am a very happy person. l hope this is my legacy. ‘You may know about The Salvation Army’s service which seeks to locate family members with whom contact has been lost for some reason. ………..You could have knocked me down with a feather!!!!!!!!!!!! It was my dad’s niece Dorothy……l was still excited from my mother’s side of the family contacting just 9 days earlier……9 always was my lucky number!